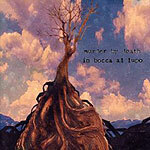 CD review: "In Bocca al Lupo"
This review first appeared in Turbula in November 2006. Bloomington, Indiana's Murder by Death is a cross between the Pogues and early King Crimson. The Murder by Death sound is anchored in equal parts by the haunting cello of Sarah Balliet and the deep baritone vocals of Adam Turla. The style of the songs ranges from the angry folk rock of "Brother" to the Pogues-flavored sea chantey of "Dead Men and Sinners" through the tango-infused art rock of "The Organ Grinder" through the punk country of "Sometimes the Line Walks You." What is consistent throughout are the stellar musicianship of the Murder by Death, the imaginative arrangements to each song, and the powerful delivery of Turla's singing. If there's any kvetching here, it's in the lack of a catchy, grab-you-and-don't-let-go signature song. But it's only their second In Bocca al Lupo, and the intriguing sounds found here are already well worth your attention and coin.